October 30, 2013 - Michael Marlowe, Sr. VP of Operations at third-party logistics provider Kane Is Able, Inc. (KANE -- www.kaneisable.com), and Sean Vasquez, from Sun-Maid Growers of California, co-presented the session, "Realizing Supply Chain Cost Reduction Through Collaboration," on October 22, 2013, at the recent CSCMP Annual Global Conference in Denver, Colorado. The two consumer packaged goods (CPGs) logistics experts discussed the advantages of establishing collaborative distribution centers for small- to mid-sized companies. The collaborative distribution strategy drives storage and transportation efficiencies as participants consolidate less-than-truckload (LTL) loads into multivendor full truckloads going to retail distribution centers (DCs). The session included a detailed case study of how Sun-Maid partners with KANE to gain efficiencies helping Sun-Maid compete with its largest rivals. Seven KANE executives, including President and CEO Pete Westermann, attended the conference. As a signature sponsor of the conference, KANE provided bottled water for all participants featuring a custom-made coast-to-coast KANE label. 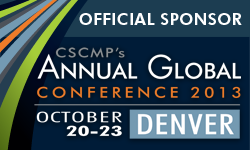 The CSCMP Annual Global Conference hosted more than 3,000 supply chain professionals from around the world for educational information and networking opportunities. It offered educational sessions on current trends, new research, and professional development, as well as on core topics such as transportation, warehousing, inventory management, and third party logistics.